BAGHDAD - Iraqi officials say three mortars have landed near the gate of a much-revered Shiite shrine in the city of Samarra, wounding at least nine people. 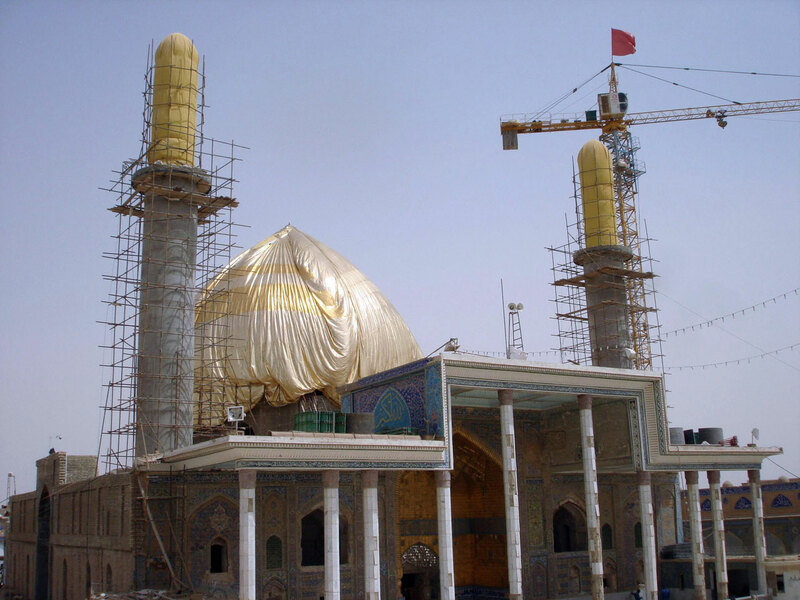 The golden domed al-Askari mosque in Samarra is one of the holiest shrines in Shiite Islam. Sunni militants blew up the dome in 2006, helping trigger some of the country's worst sectarian bloodshed as Shiite extremists retaliated forcefully. A successive series of bombings in 2007 at the site also destroyed all of the original building's structures, and led to more sectarian violence. The deputy head of the Samarra municipal council Mizhar Fleih says the attack took place Monday evening and the shells struck a reception area near the gate. He says nine people were wounded. Iraqi military spokesman Lt. Gen. Qassim al-Moussawi confirmed the attack and casualty figures. The al Qaeda breakaway Islamic State of Iraq and the Levant (ISIS, also known as ISIL), which has spearheaded the Sunni militant offensive, has been closing in on the area around Samarra for weeks, as it sits nestled in a region largely dominated by Sunnis. Iraqi forces backed by tanks and helicopter gunships have been battling insurgents in Saddam Hussein's relatively nearby hometown of Tikrit, one of two major cities seized by Sunni militants during a rapid advance across the north earlier this month. The government received a boost with the arrival in Baghdad late Saturday of five Sukhoi 25 warplanes purchased secondhand from Russia. The aircraft is designed to provide close air support to ground forces and to destroy mobile targets. Iraqi air force commander Lt. Gen. Anwar Hama Amin said the military is "in urgent need of this type of aircraft during this difficult time." "These jets will enter service within a few days - the coming three or four days - in order to support the units and to fight the terrorist ISIL organization," he said. The planes could be deployed in the fight for Tikrit, a predominantly Sunni city of more than 200,000 some 80 miles north of Baghdad where anger towards Iraq's Shiite-led government runs deep. There were conflicting reports as to how far the military advanced in its initial thrust toward the northern city. Residents said militants were still in control of the city by nightfall Saturday, while Iraqi security officials said troops had reached the outskirts and the provincial governor said they had pushed into the city itself. The government has presented the campaign as a rebound following weeks of demoralizing defeats at the hands of insurgents led by the al-Qaida breakaway Islamic State of Iraq and the Levant. The militants' surge across much of northern and western Iraq has thrown the country into its deepest crisis since U.S. troops withdrew in December 2011, and threatens to cleave the nation in three along sectarian and ethnic lines. If successful, the Tikrit operation could help restore a degree of faith in the security forces - as well as embattled Prime Minister Nouri al-Maliki, who is fighting to keep his job. Saturday's fighting began before dawn with helicopter gunships carrying out airstrikes on insurgents who were attacking troops at a university campus on Tikrit's northern outskirts, Iraqi military spokesman Lt. Gen. Qassim al-Moussawi said. The government forces had established a bridgehead on the university's sprawling grounds after being airlifted in the previous day. Sporadic clashes continued throughout the day at the university. At the same time, several columns of troops pushed north toward Tikrit from Samarra, a senior security official said on condition of anonymity because he was not authorized to brief the media.